Here's another snowflake that just fell off the shuttles. It starts with a basic 6 ring daisy and requires 2 shuttles. It uses 2 split rings to climb from the daisy into the second row, but other that that it's all just ring and chain and I think it turned out kind of cute. 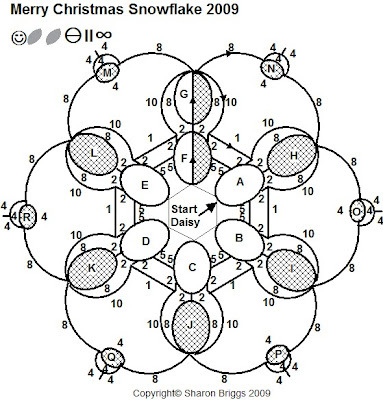 For those of you in need of a quickie snowflake, here's the pattern. For anyone who doesn't know how to do split rings you can complete the daisy and cut the thread, then start again with ring "G" as a normal ring and just follow the pattern. There are normal joins from the rings on the second row to the top of the daisy petals and shuttle joins (lock joins) where the chains join to the tops of the daisy petals. There is 1 stitch which is easy to miss going from one petal to the next. So it's shuttle join on one petal, 1 stitch and then shuttle join on the next petal. The outer chains on row 3 are broken up with a ring and then a chain joined to the tip of the ring. Wow Sharon all of your snowflakes are so pretty...Are you planning on doing a book of snowflakes...the way you are crank them out...I think you will have enough snowflakes to do a book justice. If you need a proofer...look no farther than me...LOL...I am here shuttles ready. I'm working on it, but I think I need a few more designs yet. that's really pretty... thanks for the chart. Very nice, thank you for sharing this pattern. Thank you for sharing the pattern and Merry Christmas! A really elegant design, Sharon. I love it! 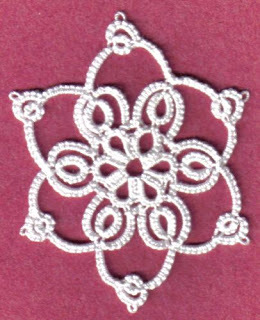 This snowflake is ADORABLE, and I can vouch for the pattern because I just finished tatting it, and it took me only one hour. Possibly the next one will be even faster! Wonderful diagram! I didn't do the split-ring climb-out, and rounds 2 and 3 can be done without a break. Very cool! I tatted it in Lizbeth white, size 20, which really holds its shape. I added a sweet blue rhinestone in the center on both sides (self-adhesive ones, from my scrapbook supplies), and it looks SO sweet. Now I want to make a few as gifts! Of course, I'll be posting it on my blog ASAP. Problem is I MUST get my cards out tomorrow. (Last-minute, as usual.) Then there's some driveway snow removal on the agenda (fortunately not as much as SOUTH of Pittsburgh). Thanks so much for this wonderful gift to us! I love it! Thanks for sharing and Merry Christmas to you and your family. I will be using this pattern I am sure! Plan on getting a head start on Christmas presents for 2010. My goal is at least 6 patterns x 5. Should make for great early Christmas gifts to the family. I know this is quite an old post by now but I printed your pattern ages ago and finally got around to tatting it. It's such a pretty pattern and I just wanted to thank you! Hope you'll still notice this comment. I posted about it on my blog and linked back to yours. Look! It's not a snowflake!